If you regularly pop into Topshop, then I'm sure you've all heard of this brand, with their colourful and quirky packaging they're hard to miss. I was kindly sent a few products by Anatomicals to try and I have no complaints, which is why these products have officially made it into my spring skincare routine. I always find it so much easier to keep a regime up when all the products are from the same brand, as they're all staring me in the face when I'm in the bathroom, and with this colourful lot I haven't failed yet! Keep reading to find out my thoughts on the products. Anatomicals are a cruelty-free brand who provide hair, body and face products that are paraben free and they pride themselves of only wanting 'you for your body'. Their products are quirky yet simple, there's no crazy ingredients in them. Their products are also very affordable so you can get a whole skincare range for under £15. What I love about this facewash is that it creates more of a soapy lather than 'scrub' which means my skin does not end up red and irritated after (I have very sensitive skin). The product smells pretty similar to the Simple range which is all good with me because I used to use simple when I was younger and had no problems with it. I use these to take my make-up off in the evening and find they don't irritate my eyes or skin. I've used other cleansing pads before that really made my skin sting so I thought I would have the same problem with these but they're fab. I apply this every morning and sometimes top up in the afternoon if I'm not wearing foundation. It's pretty light so my face never ends up looking oily just has that natural highlight. It also makes a good base before applying my foundation so that I don't get any streaks and my skin doesn't dry out throughout the day. It also contains SPF15 and co-enzyme Q10 so it protects you from the sun and fights wrinkles at the same time. As mentioned my skin can be pretty problematic which is why I tend to prefer brands that aren't too crazy and have over 20 ingredients in them. I've had no problems with this brand and find my skin is reacting great to it. No blemishes for now! 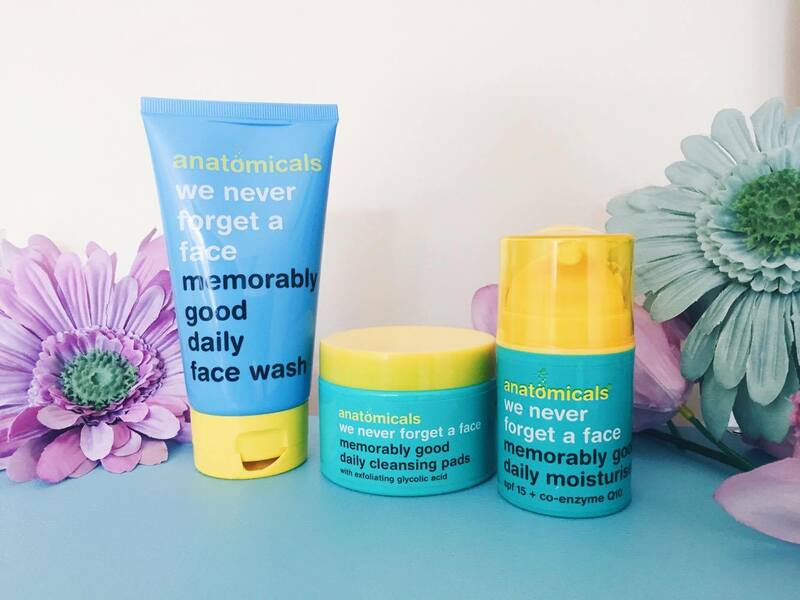 Have you ever tried Anatomicals? What products are currently in your spring skincare routine? *these products were sent to review but all views and opinions are always 100% honest. I've never actually heard of Anatomicals but I don't really shop in Topshop as I find their clothes to be relatively low quality for the price tag however their makeup used to be a bit of a holy grail for me as I only use cruelty free so their sunbeam highlighter and matte lipsticks still hold a place in my heart and in my makeup bag. Will definitely have to give something from this range a try! I've heard so many bloggers raving about the Anatomicals range that I am so tempted to try it out for myself! I'm especially intrigued by the cleansing pads, I am currently looking for some that are ideal for eye makeup removal, and as you say these are so gentle, they may be exactly what I need! Thanks for sharing your honest thoughts! I've never tried these products but I do want to. I've heard so many good things! This is the first time I've heard of this brand and oh my gosh I'm obsessed with their minimalist packaging! I love how they're cruelty free and paraben free too! I've seen someone else say it - but I'll say it again. I totally recognise this branding (do they also do hangover cures?) but didn't know the name and didn't realise they did skin care! My marketing back ground tells me their doing something wrong there....but even so these products sound fab. I've been on the lookout for a new skin care brand - I have to switch it up every six months or it just stops having any affect - and think I'll take the plunge with anatomicals! Now I know the name! I did not know that they did skincare! I had a body wash from them which was rose scented and it was so strong I couldn't decide if I hated it! I haven't tried much from Anatomicals but they did used to do an eye cream called 'Puffy the eye bag slayer' which I always thought was hysterical! I don't know much about this, so this was a very interesting read! I didn't know they were cruelty-free; that's great for me! I have to be careful with skincare because of my eczema but I've always loved their packaging! I also have to be really careful with skincare due to my psoriasis but I think I might give this a go. I am terrible at skincare routines, but this looks like one I could work with! Looks great and sounds perfect! I hardly ever go into Topshop (it's not my normal style) but I might be tempted to pop in just for these products. I am rubbish at maintaining skincare routines so I'm always looking for something simple and affordable. You had me at cruelty free and affordable. I may look in to these when my superdrug cleansers have run out. The packaging reminds of me of some of the Boots own products! I like it. I've never thought about buying skincare from Topshop, however? But I've never been that adventurous with my skincare!